Microsoft Visual Studio Express 2013 for Web (free download). Securing (ASP.NET) Web API based architectures (video). ASP.NET Web API 2 (tutorials). OAuth 2.0 Authorization Framework (specification). Open Web Interface for .NET (OWIN). Writing an OWIN Middleware in the IIS integrated pipeline (tutorial). 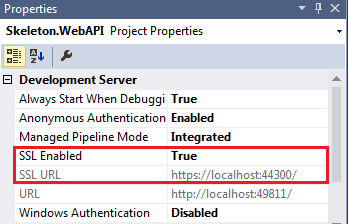 Enabling Cross-Origin Requests in ASP.NET Web API (tutorial). Create an ASP.NET Web Application (Visual C#) in Microsoft Visual Studio Express 2013 for Web. Let’s name it Skeleton.WebAPI. 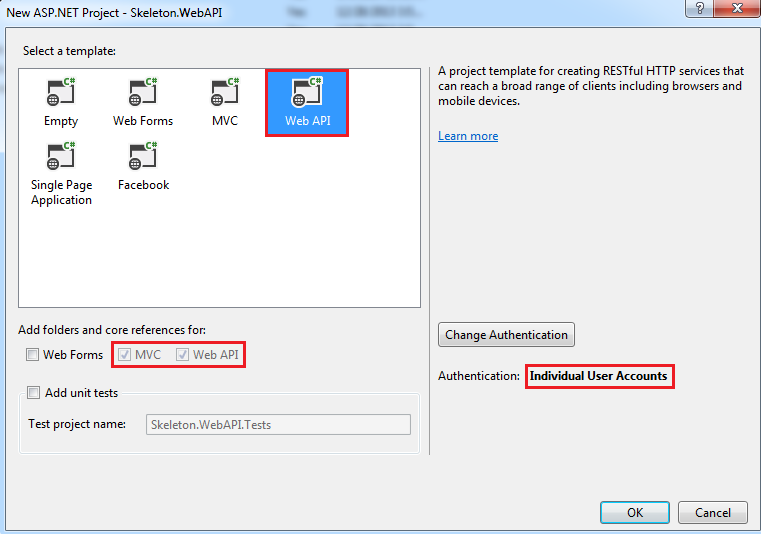 Select the Web API template and Change Authentication from ‘No Authentication’ to ‘Individual User Accounts’, [screenshot]. The ‘Controllers/ValuesController.cs’ holds our sample API endpoints. Run the project and in the browser go to ‘http://localhost:port/api/values‘ and you should get a 401 Unauthorized. In ‘Controllers/ValuesController.cs’, comment out [Authorize] to disable authorization. Run the project and in the browser go to ‘http://localhost:port/api/values‘ and now you should get 2 values. Change ‘Controllers/ValuesController.cs’ with the following code to enable CRUD operations, [Link]. This controller now accepts HTTP GET, POST, PUT, and DELETE to receive a list of values, add a value, update a value, and delete a value. Currently, these values are stored in the Web Server memory, but ideally they will be saved in the database. I recommend using Repository Pattern for it, [More info]. It tells the server the accept all types requests. You can obviously filter out the requests. For more customization, read this. At this point, we have completed Objectives 1 and 2. The code up to this point can be downloaded from https://github.com/rfaisal/ASPWebAPI_Example_OAuth_CORs/tree/crud_cors_only_v1. In the simplest terms, here is how oAuth (or most token based authorization) works. The client request an Access Token from the Authorization Server. The Authorization Server verifies the identity of the client somehow and returns an Access Token, which is valid for a limited time. The client can use the Access Token to request resources from the Resource Server as long as the Access Token is valid. In our case, both Authorization Server and the Resource Server are the same server, but they can be separated easily. Ideally, you need to write an OWIN Middleware in the IIS integrated pipeline for oAuth. But, the VS template generates the necessary codes for the OWIN Middleware. Watch this video to learn more about these implementations. Now, we will add 2 more functionality, namely registering a new user and requesting a Access Token based on the username and password. Then you can call the end point http://localhost:port/api/Account/Register/ and HTTP POST an object consisting of UserName, Password, and ConfirmPassword to register an account. It says that the client can request an Access Token by calling http://localhost:port/Token endpoint and HTTP POSTing grant_type, username, and password as Url Encoded String. This endpoint, however, is not an API endpoint. To enable CORS to this endpoint we need to add the following code segment to the ConfigureAuth function of App_Start/Startup.Auth.cs file. At this point, we have completed Objectives 1, 2, and 3. The code up to this point can be downloaded from https://github.com/rfaisal/ASPWebAPI_Example_OAuth_CORs/tree/crud_cors_oauth. Finally, we also want the Token request to be enforced over HTTPS. To do so, remove ‘AllowInsecureHttp = true’ from Startup.Auth.cs. To test the SSL enforcement, change the SSL Enabled property to true for the Development Server in Visual Studio and use the SSL Url, [screenshot]. The final code can be downloaded from https://github.com/rfaisal/ASPWebAPI_Example_OAuth_CORs/tree/crud_cors_oauth_ssl. A screenshot of the client, [screenshot]. To run the sample project in VS 2012 we need to do the following changes. 2. Open the local db on vs server explorer. remove the AspNetUsers table and execute the new query on server explorer. This will resolve the issues. Is it possible to use Web API 2’s build in external authentication with Angular JS being hosted on a different web-server? If so does anyone know of an example? I’m struggling to get it working. The facebook request is giving me a CORS issue. I’m not sure what is going on. My only guess is the redirect is coming from a different domain than the web api is hosted on. Which is what is doing the facebook configuration. I am assuming you just uncomment app.UseFacebookAuthentication in Startup.Auth.cs and using it the same way the Web API template example is using, except the WebAPI and client is hosted in different servers. In that case, adding the domain urls for both your hosts to facebook app settings should work. If not, can you please send me your login flow. 3.) 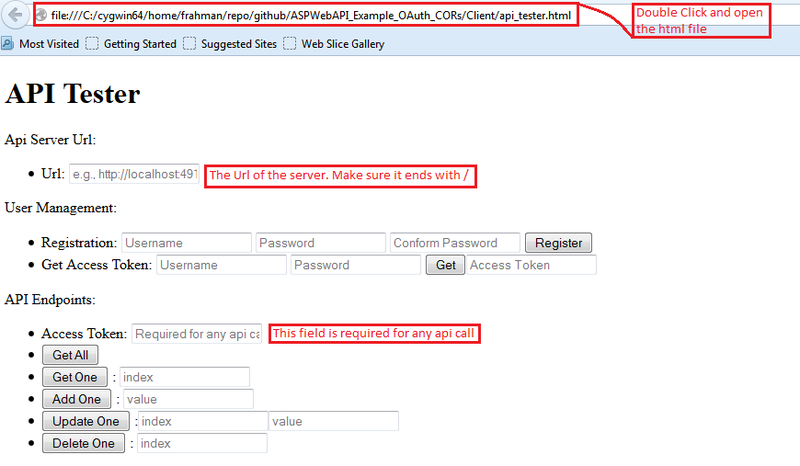 When the user clicks login with facebook button, the web api endpoint api/Account/ExternalLogin. The user is not authenticated to the ChallengeResult is returned. This is where the redirect to the facebook login page should happen. I see the request being made in chrome dev tools but the redirect gives me a No Access-Control-Allowed-Origin error. I notice the redirect request has a Origin header with a null value. I think this is the problem but I don’t know why its there. I can duplicate the api call in fiddler to my api/Account/ExternalLogin api, but remove the Origin header, and I dont get the No Access-Control-Allowed-Origin error. The origin header gets sent to my API from my angular js client, but im not sure why its on the redirect, or why the value is null. Not sure if thats the problem. Sorry, I haven’t had a chance to look into this yet. I will do it tonight, please check back tomorrow. 5. Run the SPA and click on the login with facebook button. I’m going to start fresh and try exactly what you just did. Thanks for the response. I will let you know how it goes. Could you zip up your working solution and email it to me at dmolesky@kent.edu? is there a second part or has this tutorial changed after getting published ? I can’t see any details about DB in here so I’m confused how to authenticate and store user data for this application? I think Jimmy may have asked his question because he and other readers may not know that when you create an asp.net web api project you can specify authentication — individual users accounts and this will generate the database/mdf and entity framework layer for it. question 1: But instead of using entity framework …how can we implement it with simple ado.net ? question 2 : can it be done without using MVC? 1. It doesn’t matter what data-source you use and how you use it. It will still work with MySQL, MongoDB and of course, ADO.Net. You need to modify the AccountController.cs file only. 2. Yes, it can be done. In fact, in the example, there is no view only Model and Controller. can you help me by giving simple example of above using local database without entity framework or tell me what changes i have to make in order to do so…. I am newbie to Web APIs. I wanted to know if we dont have Owin Middleware, still your code will work ? Because I am trying to run your code and its giving me 404 for Requested URL localhost:(myport)/Token. I am pretty sure you need OWIN. 404 is a “Not Found” error. Without looking into details I can only advise to make sure that the API project is running. Thanks fir your reply. I was able to figure it out. You mentioned you resolved your issue…care to elaborate? I’m having the same issue where I get a 404 when hitting my TokenEndpointPath at /token. Can you please post your code here ? without looking your code I can not tell what exactly you are having…. Simply want to sayy your article is as astounding. The clarityy in your publish is jst great and that i caan assume you’re a professional in this subject. to stay updated with coming neqr near post. Thank you one million and please carry oon the enjoyable work. I tried the same structure but using the MVC as test site. When I tried to get token, I got bad request error. Where is my problem, I need get this token to set further request. change to below code for Oauth token. res.Headers.Set(“Access-Control-Allow-Credentials”, “true”); // add this line. even though I got the correct password, any ideas? Ok , I dont know why, but even though I have registered the username as gab, when I request the token, I have to use the username as the value I passed as an Email beacuse the username gab returned that error, but the email did not. this is the first demo that work for me. To be persistent like a mobile application have to be, I need to store the TOKEN in some place in the local divice. The authentication and the authorization work very fine. BUT if i copy the Token and try to access to the secure resource in other client, divice or machine, then the web api just give me access to the secure resource. Do you understand my concern?, I am very worry about other person can read the token and access to other user profile with out problem. So, there it is a way to include other parameter for the authentication and the authorization like macadress or diviceid?. You know that it can be ?? 3. i didn’t create any table at back end i am just using the code as it is available. I tried to run this example, But I always get this error in chrom browser. Can you help me out what’s wrong and how can I make it work? Thank you! This works perfectly for me, but how can I extend it to use refresh tokens?